How Do I Keep My Computer from Being Hacked at Night? - Ask Leo! How Do I Keep My Computer from Being Hacked at Night? Hacking attempts happen all day long. You really need to protect yourself 24/7. Fortunately, there are several steps that you can take to stay safe. I’m online sometimes late night into the morning. Being an IT student, I’ve read about hackers using the night to scan for active IP addresses and hack it using back doors for fun. Can you recommend any free software that can help prevent back door attacks and work alongside my anti-virus and my Windows firewall? Also, should I change from Windows firewall? To be honest, I’ve never, ever heard of this so-called nighttime scanning. I wouldn’t believe it if I did. It’s always nighttime somewhere and the internet is global. My servers are located somewhere in Michigan, but hackers from China try to hack into them at all hours of the day. It happens constantly. The reality is that any computer connected to the internet is being attacked in one form or another pretty much all the time. It’s one of the reasons why tech people like me speak so religiously about anti-malware tools and firewalls. 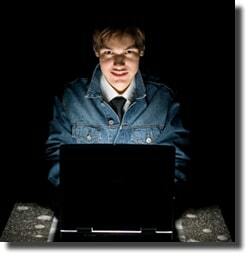 But there are a couple of different ways to discourage hackers from choosing you. In your case, your firewall and your anti-malware tools are the free software that you want – they’re preventing external contact attempts from reaching your computer. It’s the usual litany of things to do to keep your computer safe. Windows firewall is a good solution and I often recommend it when people are traveling so they don’t need to carry additional hardware with them. If you’re in a situation where it makes sense, think about getting what’s called the NAT (Network Address Translation) router. Connect to that instead of connecting directly to the internet to put another level of a hardware firewall between you and the various forms of attack. When you have that in place, I actually don’t recommend that you bother with things like Windows firewall. Some people disagree with me on that and that’s okay. But the point is that a hardware firewall provided by a NAT router is a really good form of protection. The most important way to keep yourself from being hacked is your own behavior and common sense. Most malware and hacks these days aren’t the kind of things that can be blocked by firewalls. In fact, they’re invited by you onto your machine. How? You download something from a site that’s malicious to begin with or has simply been compromised. You open an attachment in an email. With both of these actions, you told the firewall that you wanted that. The firewall’s just doing what you tell it to do. So, make sure that you understand what we’re talking about when we talk about good behavior and common sense on the internet. I will point you at my internet safety article, “Internet Safety: The Things You Need to Do to Keep Your Computer Safe on the Internet.” Most of things that I’ve talked about here are in there plus a couple of others. « Previous post: Why is my computer’s fan coming on? how do i get “ask leo” sent to me daily . Sorry but you can’t. “Ask Leo!” newsletter is sent out on a set schedule (weekly). You can, however, open it up each day and read it! And if you want to be on top of articles as they are published, keep your eye on the website. All new articles show up in the righthand column as soon as they are published. I usually turn off the router and modem when I am not using my computer. Keep your firewall on and active at all time while using your PC. NAT router is a good way to go. With all that, you can be pretty well covered..
“At night” – local time – is a common time for people to not be using their computers. When your computer is off, it is absolutely invulnerable to malware. It is also some protection against power spikes & brownouts, especially if you’re not using an uninterruptible power supply. So, for the one-third of your life that you pry yourself away from the screen because you are asleep, turning it off can be some protection against what’s happening all of the time when your computer is on. I have an older Dell with Win 7 and I use Google Chrome. I used to turn it off every night, but I decided to start using Hibernate because it boots up faster (Google takes forever). I’ve always felt safe against hackers because I have everything plugged into a monitor stand that is also a surge protector/power strip, and I always turn that off as well. Therefore the computer has no access to power because the power strip switch is physically turned off. I’m confident that this makes my computer 100% unhackable, but I cannot get confirmation from any online article. If the computer has no power I know of no way to hack it.